Call in at the small town of Haines, Alaska and choose to take a bicycle ride around a glacial lake or raft to the Chilkat Bald Eagle Preserve, where the highest concentration of bald eagles in the world thrive. Be sure to stop in at local stores or, in the evening, at one of the town's bars to hoist a few pints of local craft ale and mix with locals. 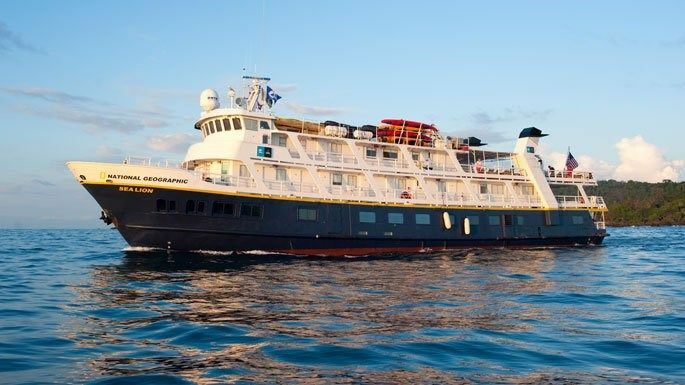 Explore under the sure guidance of an expedition leader, five veteran naturalists, including a Lindblad-National Geographic certified photo instructor, plus a wellness specialist–the largest and most knowledgeable expedition team in Alaska. Their knowledge and passion for Alaska is the key to your once-in-a-lifetime experience. Gentlemen prefer Haines. And ladies too, of course, particularly those who seek out idyllic, wildlife-filled settings. This small coastal town, in the upper region of the famous Inside Passage, is the starting point of the Chilkat Trail, a canoe portage route for Indians on their way to the salmon spawning area of the Chilkat River. As the easiest route through the coastal mountains, the Chilkat Trail was later traveled by thousands of miners heading for the Klondike gold fields. Some Royal Caribbean cruise ships visit Haines for five hours in the evening, but although you’ll be seeing this natural wonderland during the evening hours, there’s still plenty of daylight, compliments of Alaska’s famed midnight sun, which shines longest in summer. On Song of Norway’s 11-night Alaska cruise, you’ll spend a full nine hours in Haines.